When I saw Millie's new classic movie survey, I knew I had to do it. 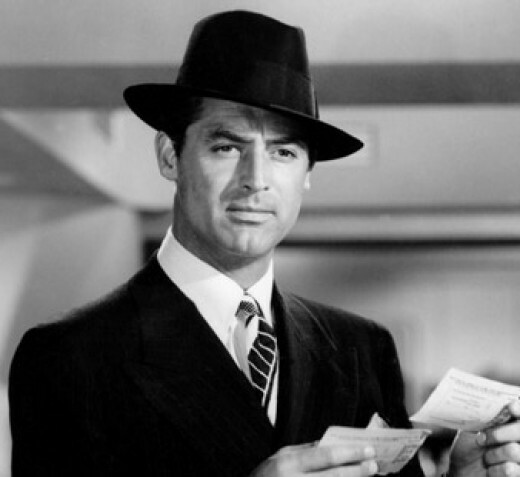 So, if you're not an old movie fan, I'm sorry that you may find this post incredibly boring. But I am so excited about it! Edit: This survey took me so much longer than I expected! You all already know I have a problem with the word "favorite." 1. Which actors do you always (or did you always) mix-up? Before I was a big classic movie fan, I always heard about Audrey Hepburn and Katharine Hepburn and didn't know the difference between the two. I at least thought they were related. Good grief, what a difference: Audrey is one of my favorite actresses and Katharine one of my least. There are other actors/actresses in old movies that I still get confused if I haven't seen them in many movies, so I tend to clump them in a group, LOL. 2. Gidget or Beach Party? I haven't seen either, LOL. This is so hard. I love vintage fashion, so this is almost impossible. I love everything in "Sabrina," and all of the adorable clothes (and hats) Jean Arthur wore in the late 30's-40's. So I'm just going to go with this one, which I always thought was beautiful: Rosemary Clooney's black dress from "White Christmas." 4. If you could be ANY character in ANY movie...who would you choose? Maybe Kathy Selden (Debbie Reynolds) from "Singin' in the Rain." She gets to wear those adorable 1920's clothes and get romanced by Gene Kelly. 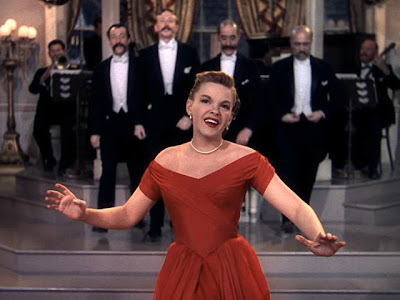 Or Veronica Fisher (Judy Garland) in "In the Good Old Summertime." It's such a sweet movie, and I really like her character. 5. If you could marry ANY character in ANY movie...who would you choose? Right off the top of my head, I'd say Joe Bradley (Gregory Peck) from "Roman Holiday." 6. If you could live in ANY movie...which would you choose? I have no idea. 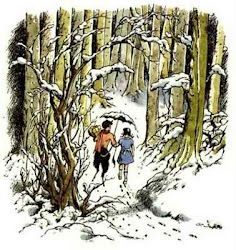 I would say Narnia, but those movies aren't classic movies. I can't decide. 7. Black & White movies you wish were in Technicolor, or vice-versa? None really. I really only like movies the way they were meant to be, whether black and white or Technicolor. "Singin' in the Rain," of course. I love that soundtrack (my second favorite after "Pride and Prejudice"). All of the songs are so lovely and fun. 9. Favorite Movie Dance Sequence? Only the best one ever...Gene Kelly in "Singin' in the Rain." It gives me chills every time I watch it. I haven't really ever seen either. 12. "Isn't It Romantic" in most Billy Wilder films, or "Red River" in most John Ford films? "Isn't It Romantic? ", of course! I love, love, love that song. 13. If you could re-cast ANY role in ANY movie, what would it be? 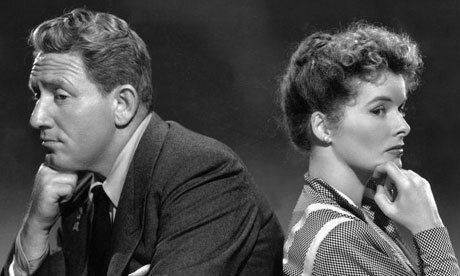 Maybe one of Katharine Hepburn's roles, with someone I liked better than her. 14. Favorite movie character with your first name? 15. One movie that should NEVER be remade? Ugh, I hate remakes! No movies made before 1960 (or so) should ever be remade. But especially "Casablanca," "Singin' in the Rain," or "Roman Holiday." 16. Actor or Actress who you would love to be best friends with? I think Audrey Hepburn would make a lovely friend. 17. Are you an Oscar or a Felix? Is it terrible that I had to look this up? Apparently, I'm a Felix. 18. Actor/Actress you originally hated and now love? This is a tough question. I don't hate any actors or actresses, I just dislike a few. I could not stand Katharine Hepburn until "The African Queen." I really liked her (not loved her) in that one. Since then, I've discovered that she's perfect with Spencer Tracy. Other than that, I still don't like her too much. I think she always plays arrogant, conceited, feminist characters, and I can't help but wonder if she was like that in real life. 19. Actor/Actress you originally loved and now don't like? I can't think of any...Usually when I read about classic actors/actresses' personal lives, I become really disappointed in them. But I still can't ignore that they were amazing at what they did on the screen. 20. Favorite performance that was looked over by Oscar? Hello!! 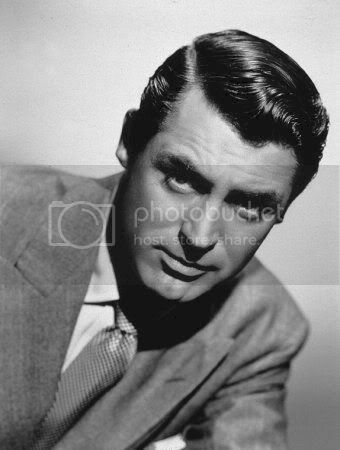 Cary Grant! Handsome, hilarious, a wonderful actor! Never got a real Oscar. 21. Bewitched or I Dream of Jeannie? I've only seen a little of both, so I can't really say. 22. Hannibal Heyes or Kid Curry? I know nothing about either one. 23. Favorite Style Icon: Fred Astaire or Cary Grant? 24. Single most favorite movie scene EVER? Maybe the before-mentioned "Singin' in the Rain" title scene/dance. Or the last scene in "Casablanca." Or the opening scene in "Sunset Boulevard" (does that make me a creep?). Or the "Good Morning" dance scene with Gene Kelly, Debbie Reynolds, and Donald O'Connor. 25. Movie you really "should" see, but have subconsciously been avoiding for who knows what reason? There are a ton of old movies that I want to see/should see, but haven't got around to it. Like "Psycho" or "The Birds." Or some famous westerns or war movies (which I've been avoiding because I don't like western or war movies, though I haven't really been fair and given them a chance). 26. Movie quote you find yourself most often repeating in real life? None, really. Though I should totally start doing that. I was just thinking the other day that I should start using "As you wish" in regular conversation. There are some great lines out there that could be used every day. 27. 50's Westerns or 60's Spies? So far, I haven't really seen any of either. 28. Favorite splashy, colorful, obnoxious 50's musical? Well, I'm partial to "Singin' in the Rain," which is splashy and colorful but definitely not obnoxious (once you get used to it). So maybe "Seven Brides for Seven Brothers." 29. Favorite film setting (example: Rome, Paris, Seattle, Siberia, Chile, Sahara Desert, etc)? I don't know. There are so many beautiful ones. 30. If you could own the entire wardrobe of any film, which would it be? Of any film- "Penelope"! 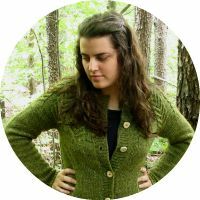 I've written a whole post about her clothes. But as far as old movies go, I'd have to say Audrey Hepburn's clothes in "Sabrina." Gorgeous. 31. Carol Burnette or Lucille Ball? 32. Favorite Voice. Ever. Period? Singing- Frank Sinatra. His speaking voice is pretty nice, too. Speaking- Cary Grant or Gene Kelly (also love his singing voice). 33. Favorite movie that takes place in your home-state? The only movie I've seen that takes place in Virginia is "Shenandoah," starring James Stewart. And I wasn't too incredibly crazy about it. I love Rosemary Clooney's black gown, too! And I simply LOVE Rosemary Clooney! I used to pretend I was her & sing that grown-up song she sings (in the black dress) when I was younger. =) Now that I'm older, I still can't sing that song without looking foolish (I would only dare if I was all alone anyway =)...Nobody sings like Rosemary!